Special model BR CAR CARPETS (with power from 20 up to 45 KW) is appositely designed for the specific HF welding of car carpets items. Its peculiarity is the distinct form with the bulky sliding lateral tray that hosts entire car carpet. The press force increases by the hydraulic drive action up to 10.000 kg in order to seal two different material with accuracy. Innovative PLC is programmed for complete system control. 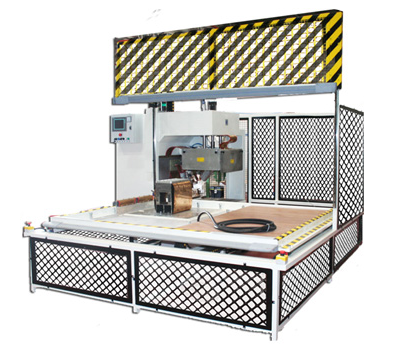 Machine equipped by ELECTRODES made by BALACCHI HF, appositely studied for the best welding results. It could be equipped with personalized 3D mould with flat and/or lateral welding.